I had a particularly challenging week last week so when I fled the office on Friday afternoon for a night at Sadler’s Wells (more on this in a later post), it couldn’t have been soon enough for me. Having been assailed with much advertising about the ‘movie epic’ Life of Pi, I wondered fleetingly as I walked by whether this was an homage to Richard Parker. But what made me stop was not the tiger but the bales of cans ready for recycling it was standing on. How strange you might be thinking but I work in the packaging industry, have been to an aluminium recycling centre and have seen what happens so I was pulled up short wondering what they were doing in the middle of St Pancras Station. Besides I didn’t find out about the milk bottle thing until I walked around to the front of the display. 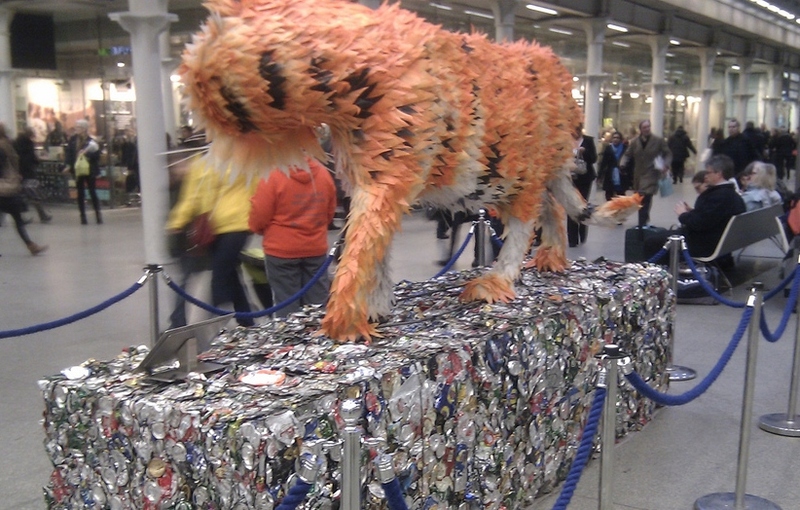 Speaking of the display, commissioned by Veolia Environment (they are one of the rubbish and recycling contractors here in the UK), it appears that it’s all part of Tiger Tracks, a Save Wild Tigers initiative designed to raise awareness and funds for tigers in the wild. It is made entirely from recyclable materials found in Merseyside’s household recycling bins. That’d be 300 milk bottles and over 58,000 cans that artist Faith Bebbington has reused and recycled to recreate this life-sized Bengal tiger. 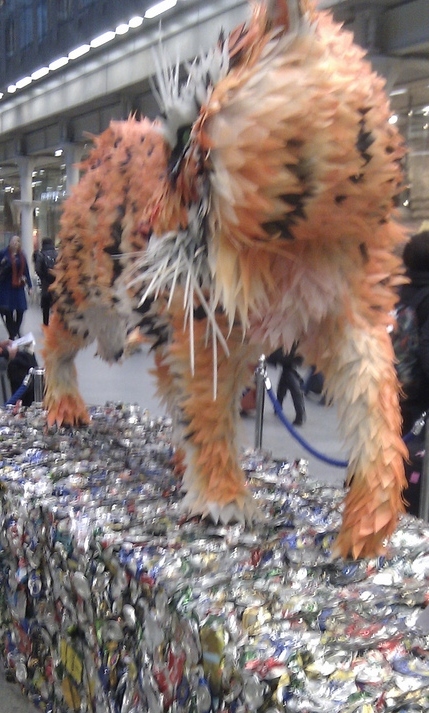 In the meantime, you can find out more about Save Wild Tigers by clicking here or by popping down to St Pancras International Station anytime during March for more tiger themed activities. Otherwise efforts to save this noble animal from extinction could amount to nothing more than catching a tiger by the tail. This entry was posted in Commuting Gems, Life in the UK and tagged Faith Bebbington, Life in the UK, recycling, Save Wild Tigers, Veolia by Kym Hamer. Bookmark the permalink. The frantic worker bees of London stop for no-one!